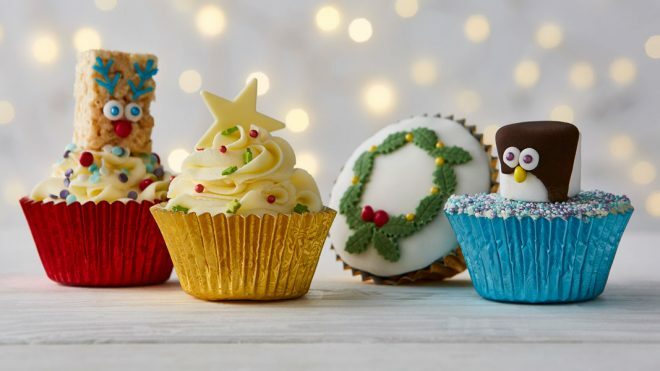 We’ve put together a few ideas for children to decorate Christmas their cupcakes with. If you’re not a fan of fruit cake just use the instructions to decorate your favourite cake recipe. Prepare the Booths ‘Easiest Christmas cake recipe ever’ cake batter which can be found here, following the alcohol free version. Divide the mixture between a 12 hole cupcake tin and bake in the oven until a skewer comes out clean. The timings depend on the size of tin you use, so keep an eye on them from 30 minutes onwards, they will take approximately 45 minutes to bake. Leave in the tin to cool slightly before transeferring to a wire rack to cool completely. 1 x pack chocolate beans, make sure there are yellow ones in there! Heat the ready ice chocolate frosting as per packet instructions, or melt the chocolate and allow to cool slightly. Dip the marshmallows into the chocolate to about half way to create the black part of the penguin, then turn onto a piece of greaseproof and allow to set. Once your penguin has set, roll two small balls of white icing and stick them on as eyes using the writing icing as glue. Fix the yellow chocolate bean in place using the same method, turn it sideways to it looks more beak-like. Take two purple or blue edible sprinkles from the tub and press them into the white ‘eyes’ to create pupils. Cover the top of the cupcake with a layer of buttercream, with a little more in the centre to stick your penguin on with. Fix your marshamallow penguin to the top, then sprinkle the rest of the cake with sprinkles until it’s covered. 1 x chocolate beans, ensure the pack contains red ones! Cut each rice crispie square width ways in to 1” strips to create the base of your reindeer. Roll two small balls of white fondant icing and using a little dot of writing icing, stick them to the front of the crispie square as eyes. Use a little dot of writing icing to fix a red chocolate bean to the crispie square as a nose. Take two purple or blue edible sprinkles from the tub and press them into the white ‘eyes’ to finish. Use the writing icing to draw on the antlers. Pipe each cupcake with buttercream, then fix your reindeer crispie square onto the top on the cake into the buttercream. Sprinkle the buttercream with sprinkles. Pipe the buttercream onto each cupcake. Place a white chocolate star onto the top. Add sprinkles to your satisfaction. You could use green buttercream if you wish to create a more tree-like effect, just add a little green food colouring to your buttercream. Thinly spread a layer of buttercream onto the top of the cake. Roll out the white icing, then cut circles the same size as the top of the cupcakes. Top the cupcakes with it. Roll out the green icing, and cut some holly leaf shapes out. We used a cutter, which you should be able to find in any baking accessories shop, or online. Create a wreath design atop your cake using the leaves, using the writing icing as glue. Roll berries out of the red icing and stick them onto your wreath design using writing icing. You could also add some gold balls as we have – get as creative as you like! Why not try our Father Christmas cupcake design too? You can find him by clicking here.